The Museum of Fossils and Ambers in San Valentino in Abruzzo Citeriore was established in January 2004. It gathers a wide collection of fossils illustrating the history of our planet in the last 500 million years and a precious collection of ambers, studied from the paleontological perspective but also from the perspective of their use by man. The items on display come from the Santoli-Tanfi and Coccato-Antonucci private collections, freely granted to the municipality of San Valentino. The Museum is divided into two galleries, with comprehensive explanatory panels: the Paleontological Gallery, including the fossil section and the mankind section, and the Ambers Gallery. 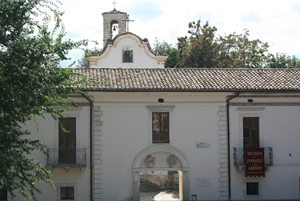 The Museum is housed in the left wing of the 17th C. Villa Olivieri de Cambaceres and, thanks to the contribution of the Province, restoration works of the right wing of the villa are about to start; the right wing will house: a third exhibition gallery for fossils from Abruzzo and particularly from the Majella area; a fourth gallery for the showcasing of dinosaurs’ bones; educational workshops and a video projection hall. The Museum, being part of the “Pangea” museum network, together with the Civic Museum of Rovereto (TN), the Geo-Paleontological Museum of Lerici (SP), the Natural History and Territory Museums of the University of Pisa and the Natural History Museum of the Piedmont Region, pursues the exchange of museum materials, project collaborations, scientific research and escavation campaigns in Italy and abroad. The Museum is curretly managed by the Association “Amici del Museo”.